“Official Stories Posters, v.1 by Liam Scheff. The first companion piece to Official Stories, an essential teaching and learning tool for classrooms – or wherever you’re reading it – and a sure conversation starter. Who were the Dulles Brothers, and who really killed John F. Kennedy? 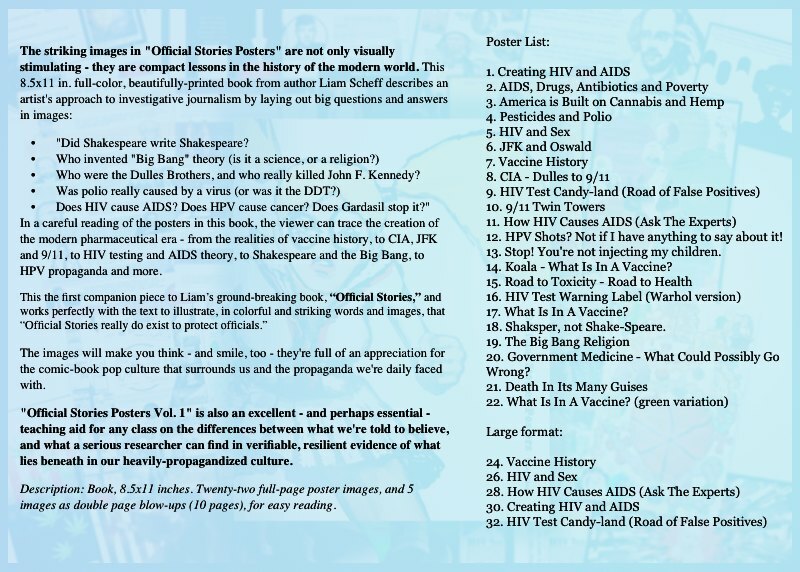 In a careful reading of the posters in this book, the viewer can trace the creation of the modern pharmaceutical era – from the realities of vaccine history, to CIA, JFK and 9/11, to HIV testing and AIDS theory, to Shakespeare and the Big Bang, to HPV propaganda and more. The images will make you think – and smile, too – they’re full of an appreciation for the comic-book pop culture that surrounds us and the propaganda we’re daily faced with. “Official Stories Posters Vol. 1? is also an excellent – and perhaps essential – teaching aid for any class on the differences between what we’re told to believe, and what a serious researcher can find in verifiable, resilient evidence of what lies beneath in our heavily-propagandized culture. Description: Book, 8.5×11 inches. Twenty-two full-page poster images, and 5 images as double page blow-ups (10 pages), for easy reading. 12. HPV Shots? Not if I have anything to say about it! 13. Stop! You’re not injecting my children. 14. Koala – What Is In A Vaccine? 17. What Is In A Vaccine? 20. Government Medicine – What Could Possibly Go Wrong?